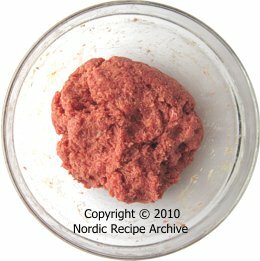 According to the renowned Swedish chef and restaurateur Tore Wretman (1916 - 2003), an ideal mixture for meatballs should contain one quarter of ground pork, one quarter of ground veal and two quarters of ground beef. You may use this same recipe to make smaller cocktail meatballs, without the cream sauce. 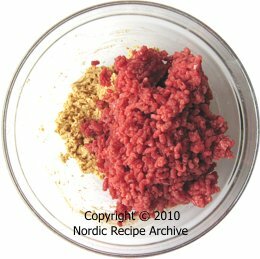 The ground meat used in various Nordic traditional dishes must be of top quality and extremely finely ground. 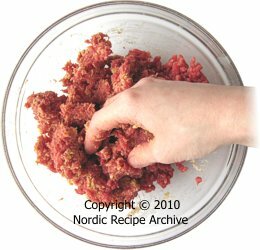 Read this important information about the quality of meat to use and instructions for grinding your own minced meat. 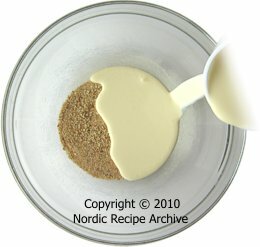 Add the cream, using two to three parts of cream at the minimum to one part of breadcrumbs (see the pictures below). Stir to form a soft paste and let the mixture stand for about 10 to 20 minutes, or until the cream is absorbed in the breadcrumbs, making them thoroughly soft. If the mixture is very stiff and dry, use some more cream. Grate the onion extremely fine or puree it in a blender  it should never be just chopped by hand, as this will leave it too coarse. If you like to soften the flavour of the onion, sauté it in a bit of butter. Add the meat and the (raw or cooked) pureed onion in the breadcrumb paste and knead until the ingredients are thoroughly mixed. Clean hands are of course the best tool for doing this (see the pictures below). Break in the egg and continue kneading until the mixture is firm, smooth and homogenous (see the pictures below). 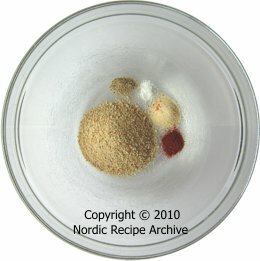 This hamburger mixture may be formed into patties of various shapes or into smaller or bigger meatballs. 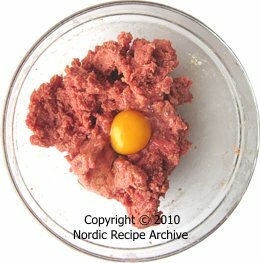 In the Nordic countries, small meatballs are considered finer and more "elegant" than big ones. 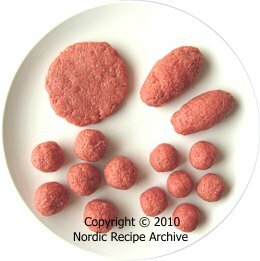 In picture on right: various shapes formed of hamburger mixture, clockwise from upper left: round meat patty, oval meat patties (called "pyyt" in Finnish, or "järpar" in Swedish), small meatballs and bigger meatballs. 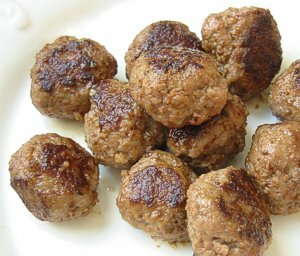 Form the mixture into small meatballs (Ø 2½ - 3 cm) with clean, moistened hands. You can place the balls on a parchment paper covered tray or cutting board to wait for frying. 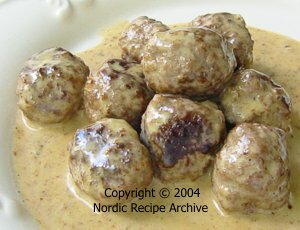 Melt some butter in a hot frying pan  Swedish and Finnish meatballs are never cooked in anything but real butter! Add enough meatballs in the pan to cover half of its bottom surface at the most, and lower the heat to medium-high. If your meatballs are firm enough, gently shake the pan so that the meatballs roll around, acquiring a round shape, and brown evenly. However, if the meatballs are fairly soft, use a wooden spatula or cooking tongs or tweezers to gently turn them over, until they are lightly browned from all over and hold their round shape. Continue cooking them by shaking the pan every now and then so that they roll around and brown evenly. 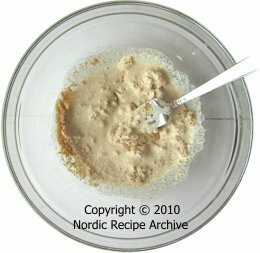 If you plan to serve the meatballs the Swedish way (see additional information below), continue to fry them in the pan until thoroughly cooked. If you are not sure whether they are done, split one in half to check it is no longer pink inside. Keep the meatballs warm while you prepare the sauce (follow the instructions here). Use cream instead of smetana in making of the sauce. If you plan to serve the meatballs the Russian way (see additional information below), they do not have to be cooked through at this stage, as they will be further baked in oven mixed with creamy smetana sauce. Pour the half-cooked meatballs in a deep oven casserole to wait while you prepare the sauce (follow the instructions here). Use smetana instead of cream in making of the sauce. Pour the creamy sauce in the casserole on top of the meatballs. Mix gently, cover with lid and cook in oven at 200 °C until the meatballs are cooked through and the sauce has thickened. Remove the lid towards the end of cooking if the sauce seems too thin. Serve the meatballs and their sauce with freshly boiled potatoes or potato puree and a tomato salad. 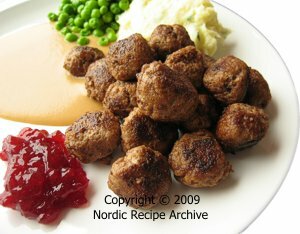 Or try the Swedish way of serving sugared lingonberries or lingonberry jam with the meatballs. 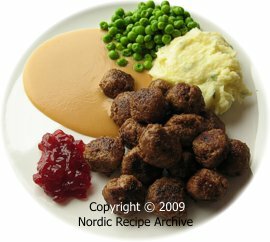 Swedish and Finnish meatballs are traditionally seasoned with allspice, but their sauce is made with cream instead of smetana. Russian meatballs  bitochki  do not include allspice, and their sauce is typically made with smetana. You can serve cold leftover meatballs sliced and layered on open-faced sandwich, or serve them with pasta, reheated slowly in a skillet with some tomato puree ("passata") and a dash of cream to make a simple, creamy tomato sauce. 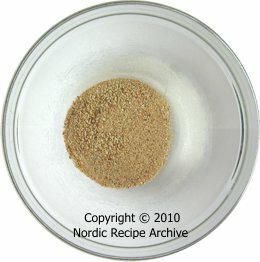 Recipe source: family recipe/traditional Nordic and Russian recipes.